Ottawa Humane Society: Do you know what happens when a bell rings? Do you know what happens when a bell rings? OK, I confess — I can get a little mushy at Christmas. I start humming and whistling Christmas music as soon as the first flake of snow hits the ground. (In December that is; in November it just annoys me.) I love the lights on Parliament Hill and even the ones here at the OHS. Port and Stilton in front of a fire are bliss. And in our house, a year rarely goes by without watching standards like the Grinch and Charlie Brown. 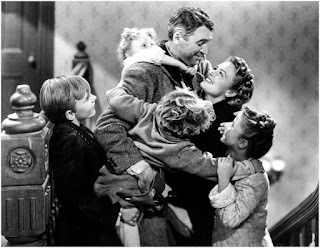 Much to the chagrin of others, my favourite by far, though is It's a Wonderful Life. I often save that one for the night I wrap gifts, just to assure that I am going to have the Christmas spirit in high gear. There is something about that movie that always resonates and moves me, especially at this time of the year. There are so many themes that I think are important: the value of friendship, the possibility of redemption, the importance of gratitude, the search for home, and of course, the interconnectedness and the value of every life. Maybe it is those same themes from that old movie that led me to a humane society, because I find them here all the time.